The events that happen within a beehive are hidden from view. But they shape the miraculous lives of our bees and, through the wonder of the whole colony, show us a truly fascinating side to nature. With tens of thousands of bees collaborating towards the growth and long-term survival of the colony, bees have remarkable resilience in the face of many threats and dangers. Yet this is all based on a repetitive and widespread story that takes place within each single cell. Multiplied across many frames, the structure we call comb is the scene of some beautiful events. One of the most obvious uses for a single cell, of course, is the storage of honey. To the layman, bees and honey go hand-in-hand and vast numbers of cells are dedicated to the build of honey reserves. But another essential purpose for which a cell is used is the raising of brood. Within each such cell, a tiny life is deposited in the form of an egg, evolves over a well-defined period of time and eventually results in the emergence of an adult bee, ready to help around the hive (if a worker) and eventually leave to forage. In this article we take a detailed look at a single cell in the brood chamber. We discuss how the cell is formed, the special characteristics that make it so well suited as a “fabric” within the hive and the scene of an amazing story that unfolds from egg to adult bee. Repeated so many times within each hive, the creation of a single cell is a small part of the structure on which bees live their lives. As beekeepers, we enjoy the beauty of honeycomb, particularly how it can store so much honey! But there are many uses to which comb is put by our bees. But what is it about the shape of the cell that is so valuable and offers so much utility to bees? Each cell forms the iconic hexagonal shape we all know. It’s no accident that the use of a connected series of cells is so often used in industry, both in terms of the physical makeup of products we use but also as a central element in many logos. To us, the cell represents stability and strength, which are positive characteristics many businesses wish to relay. Why is this? The answer is simple – because it provides strength in nature too and the example of honeycomb in hives is the most obvious example. There are a number of reasons for this. Strength : Mathematicians and designers have been curious about the relative strength of three-dimensional structures for centuries. It turns out the hexagonal is one of the strongest and rigid of shapes that can be constructed. Efficiency of Space : Not all shapes can be neatly laid side-by-side, without costly gaps. Placing many circles next to each other would obviously leave gaps. 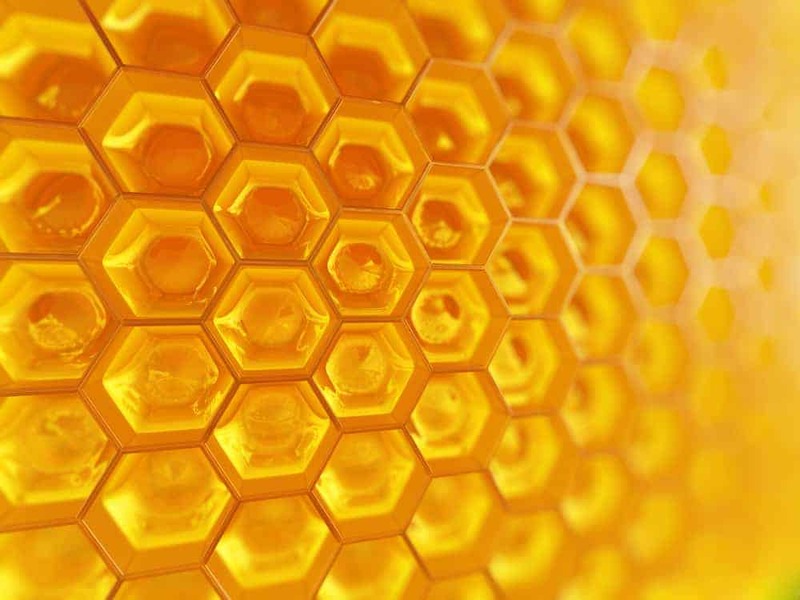 Although not unique, the hexagonal shape of the cell means comb can be extended in any direction with no gaps at all, resulting in a highly effective use of space. Efficiency of Effort : The production of comb is a very costly process to our bees. For a given unit of raw material (wax), the hexagonal cell provides a great deal of utility. So with the efficiency of cells understood, what about the substance of cells? Of course we are talking beeswax here. And, once again, there is a fascinating story to be told. Beeswax is a beautiful and flexible substance. At the chemical level it is a heady mixture of fatty acids and long-chain alcohols. The physical characteristics are well-suited to many uses in everyday life, with the use in candles being the most obvious. But to the bee it is the basis of their home. Worker bees have eight wax-producing glands in their abdominal segments, which create scales of wax. These are collected and sculpted into cells. Interestingly, these cells are created with a slight upward “tilt”, understood to be a mechanism to retain materials and brood from spilling out, before the cell is capped. The extent of that tilt can vary, but is generally between 10 and 15 degrees. As a beekeeper. you should keep this in mind when you inspect your hive. If you have reason to brush bees off a frame, use the brush in an upwards motion, rather than downwards. The reduces the risk of bees legs being damaged, since brushing upwards goes “with the grain”, so to speak. As we know, there are many debates within beekeeping circles, from the best race of bees, the effectiveness of treatment-free beekeeping, the most enjoyable type of hive and much more. So here’s yet another one – cell size. There are two aspects to this. The first is what bees will build on their own accord and how they decide cell size. We know, for example, that drone cells are larger than worker cells and have a different shape capping. Queen cells are quite different again, with their familiar peanut-like shape. The bottom line is that in their natural setting bees make decisions based on their needs. Secondly, beekeepers can install foundation with cells of a certain size. 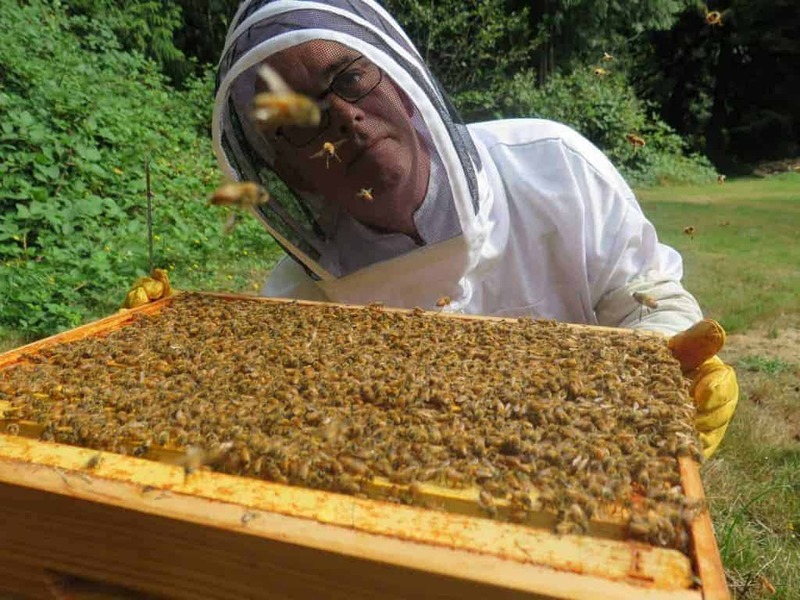 Indeed, many beekeepers use drone frames as an important element of the ongoing battle against varroa mites. In this situation, the larger and more attractive drone cells are used as a “bait” for varroa, with the frames collected and frozen to remove large numbers of varroa from the hive. At the other end of this tactical battle is the use of small cell foundation, on the basis that varroa are less able to thrive in a smaller cell. Again, many beekeepers use such foundation for just this purpose. The typical cell created by bees in nature is generally around 5.3 mm, whereas small cell foundation typically features cells of around 4.9 mm. While the pros and cons of cell size is for another article, it’s worth knowing that it is important! Having looked at how cells are formed, let’s turn our attention to one of the most important uses to which they are put, namely to raise brood. We’re going to walk through the process, from the time an egg is laid to when an adult bee emerged from the cell. Let’s consider the queen as she wanders across comb in the brood chamber. We’re going to assume we’re in mid-summer and she’s laying eggs at a rapid pace. That can mean 2,000 or more eggs per day. That, of course, means there’s a significant demand for cells in which to lay eggs. We won’t dwell on reproductive factors in this article but, as a recap, as she passes each cell in which she decides to lay an egg, she will make a decision about the eventual gender of the egg. If she lays an egg and then moves on without fertilizing that egg, she will have laid an egg destined to be a drone. If she fertilizes the egg then it will emerge as a worker or a queen. The queen has a real discipline about how and where she lays eggs. 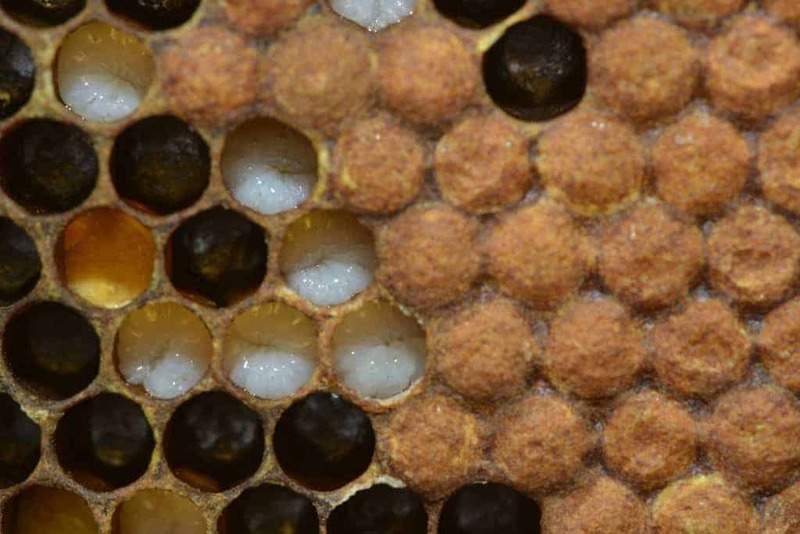 Workers can lay eggs too (always unfertilized) but they are much more haphazard, which can be a valuable clue when beekeepers are concerned about laying workers. The queen will lay one egg per cell, compared to workers who may lay multiple eggs in a single cell. The queen has a longer body than a worker, which means she can reach down deep into the cell to lay the egg. By comparison, workers do not have that reach and so lay eggs attached to the wall of the cell, rather than the bottom. An efficient and productive queen will leave few empty spots in the cell pattern, resulting in a beautiful and consistent brood pattern. Workers, however, are less disciplined and the result can be a much more haphazard use of cells, with many spots in the pattern. As all beekeepers come to learn (especially those with less-than-optimal vision), eggs are small! The average size of an egg is around 1.5 mm long and 0.35 mm long. That’s not an easy thing to see. In case you want to weigh one, you will need a pretty accurate scale, since they weigh around 0.15 mg! Another factor to consider when checking for eggs is their color. Their light color can be tricky to view against a light background, which is why most beekeepers choose a black foundation when purchasing frames for the brood chamber (white foundation is often used in honey supers). The egg is slightly wider at one end, which is where the head of the bee will grow. When laying the egg, the queen will attach the other, more narrow end of the egg to the bottom of the cell. About three days after the egg is laid it will change into a larva. This is the phase during it will achieve most of its growth, growing to around 1,500 times the size of an egg. The initial days of the larva stage are in an uncapped cell. As the egg turns to larva, worker bees will go into overdrive! They will feed each larva, in the uncapped cell, hundreds of times each day. They do so by depositing food in the cell, rather than directly feeding the larva. While this is an essential time during which workers tend to the larva to ensure there is enough food in the cell, it also an opportunity for varroa to enter the cell before it is capped. Eventually the cell is capped. The time taken to cap the cell varies. Queen cells are capped after about 7 1/2 days. Worker cells are capped at about 9 days and drone cells about day 10. Of course, cells are used for more than brood. Bees will cap honey cells and do so in a couple of ways. “Wet cappings” are placed on the cell such that the cap touches the honey stored in the cell. “Dry cappings” leave a tiny air pocket between the surface of the honey and the underside of the cappings. Dry cappings tend to have a lighter color than wet cappings. With the larva safely in her cell (let’s assume no varroa is alongside her! ), she will then start the process of growing into a pupa. This involves creating a cocoon within the cell. As the pupa starts forming, an increasing number of recognizably bee-like characteristics will become evident, such as her eyes, wings and so on. When the time comes, the adult bee will emerge from the cell. Aside from being a major event for the bee, it’s also something that has brought a smile to many a beekeeper, when they notice that small hole being formed, with a bee soon to emerge. Here is the visual story of egg growing to larva to pupa and then to adult bee, all wrapped up in one extraordinary minute by the wizards at National Geographic (complete with the appearance of a less-than-welcome visitor). And then the cell has done its job…but not really! Cells are re-used over and over by the colony. It takes a tremendous amount of energy to create a cell, so it is much more effective to reuse existing cells than build new ones. But what about all that waste? Think about this for a second. We start with an egg with a “shell” (see below). Then we add food for the larva, which has the capacity to grow to 1,500 times the size of the egg in a very short period of time. Then bees cap the call, so there’s the capping itself. Let’s start with the shell of the egg. This is quite different to the hard, brittle exterior we know through chicken or duck eggs. Instead, the egg of a honey bee is a soft, translucent material called chorion. Unlike the “cracking” of an egg we see when we prepare our breakfast, chorion simply dissolves and is eventually absorbed by the larva. So, that takes care of the egg (shell)! Next up is the larval food placed in to the cell by workers. The fate of this is rather obvious, namely it is consumed by the larva as fuel for her growth. This will facilitate her transition from larva to pupa and, eventually, to emerge from the cell as an adult bee. While we won’t dwell on this here, the queen is fed royal jelly beyond her third day as a larva, which is not the case for workers or drones. Larva eat a lot. It’s all good. But they also digest that food and what goes in has to come out. And so we turn to the feces of bee! Yet again, there’s a fascinating story with the honeybee. In adult bees the food will pass along the gut, digested as it goes, with the remainder leaving the body as feces. In that regard, it’s a pretty standard event. But for a larva there’s an obvious problem. If feces are simply expelled then she’d be swimming in…you get the picture! How is this avoided? The start and ends of the gut of a larva are disconnected! As she eats through her food, waste builds up in the early part of the gut but is cannot be passed to the end of the gut. It is only as she has finished her eating phase, around the time her first cocoon is woven, that the two parts of the gut are joined. At that time, the feces is removed from her body. But because her eating is done, there’s no danger that she will eat this. Faces will also become embedded in cocoon of the larva. This can build up over time. across many eggs and bees in the same cell. This is one reason why you will eventually see brood frames darken, eventually becoming black. Other materials also contribute to this change in cell color. After the bee has left the cell, we have a perfectly servicable cell. Workers will carry out a little housecleaning. Another interesting aspect of their work is that they will reuse the wax cappings used to cover the cell. Remember, wax is expensive for the bees to create. As such, it makes tremendous sense that they will clean up the cappings that form the hole from which a bee emerged and look to reuse it. They will often move small chunks of this to a different area within the hive, building a store of wax that can be reused on yet-to-be-capped cells.